Copy and paste data between iPhone apps and your Mac over Wi-Fi. Clip Agent for Mac allows you to share images and texts between a Mac and an iPhone via Wi-Fi using a clipboard management system. To work, this app requires that you purchase an additional iPhone app. If you're willing to buy this dependent app, you'll be able to quickly sync data between your computer and iPhone, and vice versa. 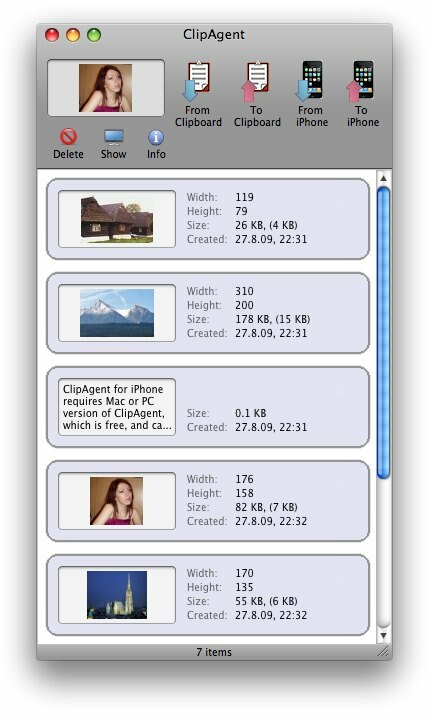 Clip Agent for Mac installs quickly and features a plain but useable interface. The menu bar offers access to some basic functions such as the ability to add a new item or new text, along with view options and a useful Help file. The application's main menu features selectable options that allow you to copy and paste files and data from any iPhone application to your Mac. Before you can copy-paste data, you must pair your devices. Pairing iPhone and Mac devices is easily accomplished using the Wi-Fi icon at the bottom of the screen. Once we paired our iPhone 5 and MacBook Air used for testing, we were able to sync data between the Mac clipboard and our iPhone application within seconds. Data quickly synced, and showed up as a detailed thumbnail image with partial file information including width, height, size, type, and date information. Powerful yet easy to use data extraction app!